Over the years there have been many food scares relating to the microbiological quality of food. In the 80’s we had Salmonella in eggs, Listeria in cheeses and botulism from yogurts and more recently the catastrophic incidences of e.coli 0157 which resulted in the deaths of several people. Fruit is a natural product grown outside, and in most instances comes from countries other than the UK and it will therefore have a number of potential risks associated with this. This is where the testing comes in. The FSA ( Food Standards Agency) was set up to regulate the food industry in conjunction with suppliers, manufacturers and retailers and with changes in the Food Safety Act and it’s interpretation the onus was put on these companies to ensure the products they supply are “fit for purpose” and have been produced in a safe and hygienic way to reduce the risk of potential food related incidents. At Treelinks we have developed a system of screening our goods on arrival into the UK from all sources, this is done by the utilisation of a general screen of micro organisms which will act as indicator organisms for potential high risk pathogens. 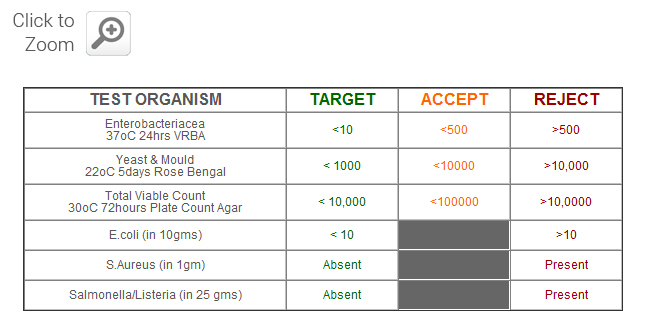 The screen is set up for Enterobacteria , Yeast & Moulds, Total Viable Count and E.coli and these tests will be carried out on all fruits from all origins as a matter of protocol and should the key indicators, e.coli or enteros, produce out of tolerance limit results then a secondary protocol is initiated which tests for Listeria, Salmonella and Staphylococcus Aureus. In the event of a positive result from the secondary tests we have an action protocol for notification to the relevant customers and a quarantine, recall and retest procedure is in place for the contaminated stock.